Researchers extracted skeletal cores from 67 colonies of two reef-building coral species across 200 kilometers of the Florida Keys Reef Tract and measured how three key growth parameters — skeletal extension, calcification and density — have changed over the past century. 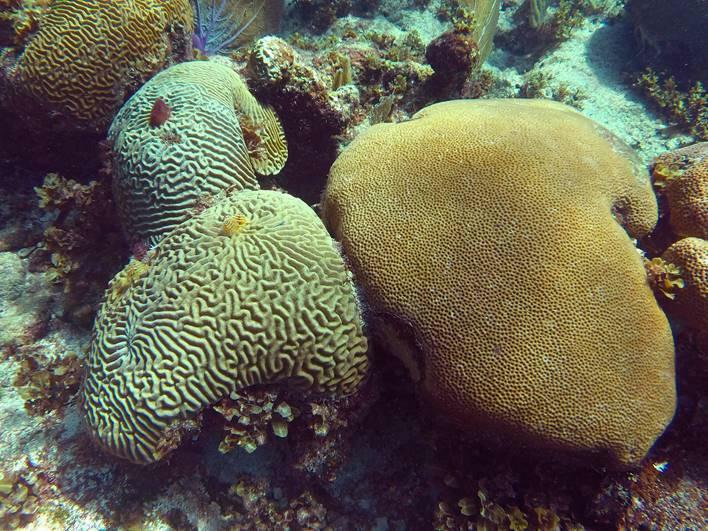 Extension and calcification rates have largely been maintained at 0.36 cm yr-1 and 0.50 g cm-2 yr-1, respectively, for the massive starlet coral (Siderastrea siderea) and 0.47 cm yr-1 and 0.55 g cm-2 yr-1, respectively, for the symmetrical brain coral (Pseudodiploria strigosa). Skeletal density has declined at a rate of 5 mg cm-3 per decade over the past century. Often referred to as "the other carbon dioxide problem," acidification is a distinct issue from ocean warming but one that stems, in large part, from the same source — carbon dioxide emissions. The absorption of carbon dioxide results in chemical changes in the oceans that reduce the availability of minerals needed by corals and many marine organisms, such as oysters, to build shells and skeletons.